In a medium skillet, brown hamburger over medium heat. Drain off fat. Combine beef, carrots, celery, onions, bouillon, water, tomato sauce, chopped tomatoes, salt, corn, basil, and ketchup in a large stock pot. Bring to a boil. Reduce heat, and simmer for at least 1 1/2 hours. 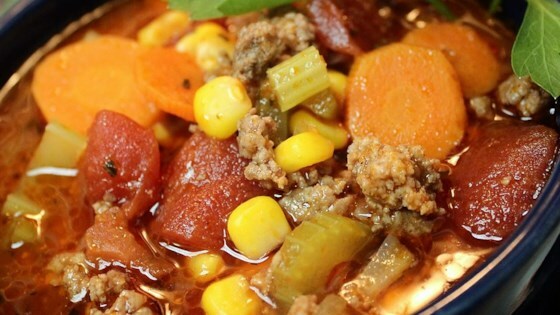 All the makings of a hamburger, but in soup form! I don't know how I can make my lean ground beef not dry when I cook this. Why is it dry anyway? It's surrounding by broth? Oh, my! This is so good! Quite possibly the BEST vegatable soup I've ever had. All did different was add some ground pepper. Served this with French Bread Rolls To Die For from this site. I was looking for my Grandma's traditional soup, and this is it! It's so easy and you can let it go in a crockpot all day if you feel like it. Highly recommended.